Did you know The Beach Hut can deliver our fabulous food to your door. 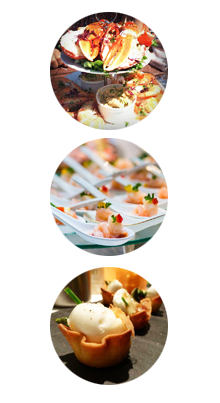 From seafood platters to canapés and parties, we can recreate our lovey dishes in your home. Emma looks after this bit, just give her a call on 07832 127737. Below is a bit of info on her and the team. Catering by Emma Guy offers something a little different. As a chef I work closely with my clients. I can create a hamper for a picnic through to a private dinner for 40 people or canapés for a party. From small and intimate, to corporate, I will offer the same good food. I come and deliver your food to you. I can even set the table. I will deliver fabulous food to wherever you want. From a beach, to a boat to a large house you've hired. Catering by Emma Guy offers a very discreet service of popping into your home, filling your fridge, setting the table and leaving you with a lovely meal. The next day I pop back and pick up the empties. No one needs know I've been! I use my own flavour combinations. I champion local suppliers. I use seasonal ingredients. I cook from the heart. I provide a discreet and private catering service. Corporate or individual. From a small dinner party. To a product launch. A small wedding. And a special dinner on board a boat in a harbour. To a crew house for professional sailors or delivering supper for 10 to a holiday home. I've been asked to do them all! Press enquiries call Emma on 07832 127737.